Today I bring you two very different images from my journeys through Spain a few years ago, inspired by the latest WordPress weekly photo challenge theme, which is ZIGZAG. The featured image (above) is from the Alcazar (palace) in Seville. It’s a simple staircase descending into a tiled foyer, but I’ve always loved the angles and colours and patterns in this photo. 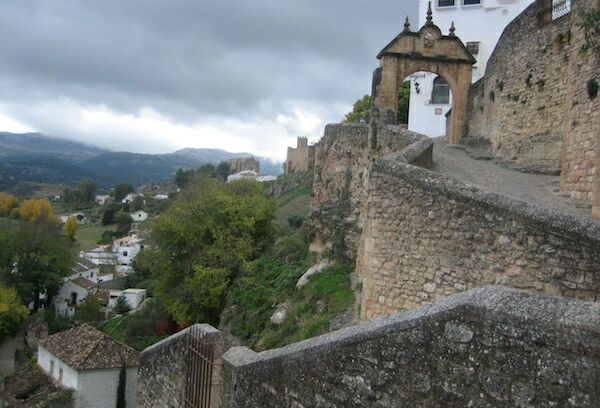 The next image (below) is from Ronda, and shows the zigzagging road descending from the plateau (where the town is located) into the gorge, where you can visit the ruins of the Arabian Baths. I love bath houses, and the ones at Ronda are pretty well preserved. This steep stone path seems to me something straight out of a fantasy novel, which is probably why I love this photo too. In fact, Ronda is one of the most stunning places I’ve ever visited.